Angkor refers to the region of Cambodia serving as the seat of the Khmer empire that flourished from approximately the ninth century to the fifteenth century C.E. (The word "Angkor" derives from the Sanskrit "nagara," meaning "city.") More precisely, the Angkorian period refers to the period from 802 C.E., when the Khmer Hindu monarch Jayavarman II declared himself the "universal monarch" and "god-king" of Cambodia, until 1431 C.E., when Thai invaders sacked the Khmer capital, causing its population to migrate south to the area of Phnom Penh. Angkor and the Khmer Empire practiced Hinduism, most likely the largest and most vibrant Hindu empire outside of India. The Khmer name has become infamously connected with the Khmer Rouge of the twentieth century, the brutal totalitarian communist regime made famous the 1984 movie The Killing Fields. That is an irony since Angkor and the Khmer empire displayed one of the world's most religious states. Almost all the buildings of Angkor had religious purposes and design. Archaeologists have unearthed over a thousand temple sites, foremost among them the Angkor Wat. The reason such a mighty empire could fall also puzzles historians. The possible causes are 1) War with Thai. 2) Decline of the Hindu state religion with the adoption of Theravada Buddhism. That eroded the Hindu idea of kingship in Khmer civilization. 3) Weakening of the empire through war, leading to a neglect of public works such as irrigation of rice fields. 4) Natural disaster, such as earthquakes or climate change. The ruins of Angkor, located amid forests and farmland to the north of the Great Lake (Tonle Sap) and south of the Kulen Hills, sits near modern day Siem Reap (13°24'N, 103°51'E). They have earned the designation as a UNESCO World Heritage Site.The temples of the Angkor area number over one thousand, ranging in scale from nondescript piles of brick rubble scattered through rice fields to the magnificent Angkor Wat, possibly world's largest single religious monument. Many of the temples at Angkor have been restored, and together they comprise the most significant site of Khmer architecture, attracting nearly one million visitors annually. In 2007 an international team of researchers using satellite photography and other modern techniques concluded that Angkor had been the largest preindustrial city in the world with an urban spread covering 1,150 square miles. The closest rival to Angkor, the Mayan city of Tikal in Guatemala, covers roughly 50 square miles in total size. Map of the Angkor region in Cambodia. The Angkorian period began shortly after 800 C.E., when the Khmer King Jayavarman II announced the independence of Kambujadesa (Cambodia) from Java and established his capital of Hariharalaya (now known as "Roluos") at the northern end of Tonle Sap. Through a program of military campaigns, alliances, marriages and land grants, he achieved a unification of the country bordered by China (to the north), Champa (now Central Vietnam, to the east), the ocean (to the south) and a place identified by a stone inscription as "the land of cardamoms and mangoes" (to the west). In 802 Jayavarman articulated his new status by declaring himself "universal monarch" (chakravartin). In that proclamation, he took the epithet of "god-king" (devaraja) Jayavarman linked himself to the cult of Shiva. His successors imitated that practice  Before Jayavarman's tour de force, Cambodia had consisted of a number of politically independent principalities collectively known to the Chinese by the names Funan (modern Khmer: Phnom) and Zhenla (真腊) (modern Khmer: Chenla). In 889 C.E., Yasovarman I ascended to the throne. A great king and an accomplished builder, one inscription described him as "a lion-man; he tore the enemy with the claws of his grandeur; his teeth were his policies; his eyes were the Veda." Near the old capital of Hariharalaya, Yasovarman constructed a new city called Yasodharapura. In the tradition of his predecessors, he constructed a massive reservoir called a baray. Some barays are used as a means to irrigate rice fields, while some historians regard them as religiously charged symbols of the great mythological oceans surrounding Mount Meru, the abode of the gods. An elevated temple, in turn, represented the mountain, and a lingam representing the "god-king". In accordance with that cosmic symbolism, Yasovarman built his central temple on a low hill known as Phnom Bakheng, surrounding it with a moat fed from the baray. He also built numerous other Hindu temples and ashramas, or retreats for ascetics. Over the next 300 years, between 900 and 1200 C.E., the Khmer empire produced magnificent architectural masterpieces in the area known as Angkor. Concentrated in an area approximately fifteen miles east to west and five miles north to south, the Angkor Archaeological Park which administers the area includes sites as far away as Kbal Spean, about 30 miles to the north. Seventy two major temples or other buildings dot the area. The medieval settlement around the temple complex measures approximately 3000 sq km (1,150 sq miles), roughly the size of modern Los Angeles. That makes it the largest pre-industrial complex of its type, easily surpassing the nearest claim, that of the Maya city of Tikal. King Suryavarman II built the principal temple of the Angkorian region, Angkor Wat, between 1113 and 1150. Suryavarman ascended to the throne after prevailing in a battle with a rival prince. An inscription says that in the course of combat, Suryavarman lept onto his rival's war elephant and killed him, just as the mythical bird-man Garuda slays a serpent. After consolidating his political position through military campaigns, diplomacy, and a firm domestic administration, Suryavarman launched into the construction of Angkor Wat as his personal temple mausoleum. Breaking with the tradition of the Khmer kings, and influenced perhaps by the concurrent rise of Vaisnavism in India, he dedicated the temple to Vishnu rather than to Siva. 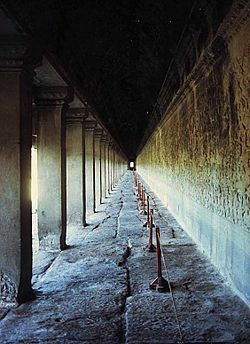 With walls nearly one-half mile long on each side, Angkor Wat grandly portrays the Hindu cosmology; the central towers representing Mount Meru, home of the gods; the outer walls, the mountains enclosing the world; and the moat, the oceans beyond. The traditional theme of identifying the Cambodian devaraja with the gods, and his residence with that of the celestials, stands in evidence. The measurements of the temple and its parts in relation to one another have cosmological significance. Suryavarman had the walls of the temple decorated with bas reliefs depicting scenes from mythology and from his own imperial court. In one of the scenes, the king sits cross legged, larger in size than his subjects, on an elevated throne holding court. A bevy of attendants make him comfortable with the aid of parasols and fans. Portrait of Jayavarman VII on display at Musee Guimet, Paris. Following the death of Suryavarman around 1150 C.E., the kingdom fell into a period of internal strife. Neighbors to the east, the Cham of today's southern Vietnam, took advantage of the situation in 1177 to launch a seaborne invasion up the Mekong River and across Tonle Sap. The Cham forces successfully sacked the Khmer capital of Yasodharapura, killing the reigning king. A Khmer prince slatted to become King Jayavarman VII rallied his people and defeated the Cham in battles on the lake and on the land. In 1181, Jayavarman assumed the throne. He became the greatest of the Angkorian kings. Over the ruins of Yasodharapura, Jayavarman constructed the walled city of Angkor Thom, as well as its geographic and spiritual center, the temple known as the Bayon. Bas-reliefs at the Bayon depict the king's battles with the Cham as well as scenes from the life of Khmer villagers and courtiers. Jayavarman constructed the well-known temples of Ta Prohm and Preah Khan, dedicating them to his parents. That massive construction program coincided with Jayavarman's conversion Mahayana Buddhism from Hinduism. During his reign, Jayavarman transformed Hindu temples by installing images of the Buddha; Angkor Wat briefly became a Buddhist shrine. Following his death, a Hindu revival included a large-scale campaign of desecrating Buddhist images until Theravada Buddhism became established as the land's dominant religion from the fourteenth century. The year 1296 marked the arrival at Angkor of the Yuan Dynasty diplomat Zhou Daguan (1266–1346). During his one-year sojourn in the Khmer capital during the reign of King Indravarman III, Zhou penned a still-surviving account of approximately 40 pages, detailing his observations of Khmer society. Topics he addressed included religion, justice, kingship, agriculture, slavery, birds, vegetables, bathing, clothing, tools, draft animals, and commerce. In one passage, he described a royal procession consisting of soldiers, numerous servant women and concubines, ministers and princes, and finally "the sovereign, standing on an elephant, holding his sacred sword in his hand." Zhou's account combined with several other historical records to give a picture of life in Angkor late thirteenth, early fourteenth century. They include the inscriptions that have been found on Angkorian stelas, temples and other monuments, and the bas-reliefs at the Bayon and Angkor Wat. Zhou's journal represents the most significant source of information about everyday life at Angkor. Filled with vivid anecdotes and sometimes incredulous observations of a civilization that struck Zhou as colorful and exotic, the record serves as an entertaining travel memoir as well. An English translation by Peter Harris in 2007 corrected errors from the previous French translation. 1431 C.E., the year Thai invaders sacked and looted Angkor marks the end of the Angkorian period, though the civilization already had been in decline in the thirteenth and fourteenth centuries. In the course of the fifteenth century, inhabitants abandoned nearly all of Angkor except Angkor Wat, which remained a Buddhist shrine. Several theories have been advanced to account for the decline and abandonment of Angkor. War with the Thai. The abandonment of the Khmer capital may have occurred as a result of Siamese invasions. Ongoing wars with the Siamese sapped the strength of Angkor at the time of Zhou Daguan toward the end of the thirteenth century. In his memoirs, Zhou reported that the country had been completely devastated by war, requiring the entire population's participation. After the collapse of Angkor in 1431, the Thai took many persons, texts and institutions to the Thai capital of Ayutthaya in the west, while others departed for the new center of Khmer society at Phnom Penh in the south. Erosion of the state religion. The decline of Angkor may have followed the conversion of Cambodia to Theravada Buddhism after the reign of Jayavarman VII. That religious transition eroded the Hindu conception of kingship that under girded the Angkorian civilization. According to Angkor scholar George Coedès, Theravada Buddhism's denial of the ultimate reality of the individual served to sap the vitality of the royal personality cult which had provided the inspiration for the grand monuments of Angkor. Neglect of public works. The weakening of Angkor's royal government by ongoing war, and the erosion of the cult of the devaraja, may have undermined the government's ability to engage in important public works. Those included construction and maintenance of the waterways essential for irrigation of the rice fields upon which Angkor's large population depended for its sustenance. As a result, Angkorian civilization suffered from a reduced economic base, forcing the population was to scatter. The great city and temples remained largely cloaked by the forest until the late nineteenth century when French archaeologists began a long restoration process. From 1907 to 1970 the École française d'Extrême-Orient directed the work of clearing away the forest, repairing foundations, and installing drains to protect the buildings from water damage. Scholars, including George Coedès, Maurice Glaize, Paul Mus, and Philippe Stern, initiated a program of historical scholarship and interpretation based on Angkor archeological findings. Work resumed after the end of the Cambodia civil war. Since 1993, French, Japanese, and UNESCO have cooperated the International Co-ordinating Committee on the Safeguarding and Development of the Historic Site of Angkor (ICC). The Authority for the Protection and Management of Angkor and the Region of Siem Reap (APSARA), created in 1995, has supervised the Cambodian work. Some temples have been carefully taken apart stone by stone and reassembled on concrete foundations, in accordance with the method of anastylosis. World Monuments Fund has aided Preah Khan, the Churning of the Sea of Milk (a 49-meter-long bas-relief frieze in Angkor Wat), Ta Som, and Phnom Bakheng. International tourism to Angkor has increased significantly in recent years, with visitor numbers reaching 900,000 in 2006; this poses additional conservation problems but has also provided financial assistance to restoration. Historical Angkor constituted the site of vast cities that responded to all the needs of a people, including religious needs. Aside from a few old bridges, all of the remaining monuments served religious observances. In Angkorian times, all non-religious buildings, including the residence of the king himself, had been constructed of perishable materials, such as wood, "because only the gods had a right to residences made of stone." The vast majority of the surviving inscriptions had been etched into the stone foundations of religious structures by kings and other potentates. As a result, the history of Angkorian state religion has been easier to write than other aspects of Angkorian society. Several religious movements contributed to the historical development of religion at Angkor. They include indigenous religious cults, including those centered on worship of the ancestors and of the lingam. A royal personality cult, identifying the king with the deity, characteristic of Angkor and other Indic civilizations in southeast Asia, such as Champa and Java. Hinduism, especially Shaivism, the form of Hinduism focused on the worship of Shiva and the lingam as the symbol of Shiva worship, but also Vaishnavism, the form of Hinduism focussed on the worship of Vishnu. And Buddhism, in both its Mahayana and Theravada varieties. The religion of pre-Angkorian Cambodia, known to the Chinese as Funan (first century C.E. to ca. 550) and Chenla (ca. 550 - ca. 800 C.E. ), included elements of Hinduism, Buddhism and indigenous ancestor cults. Temples from the period of Chenla bear stone inscriptions, in both Sanskrit and Khmer, naming both Hindu and local ancestral deities, with Shiva supreme among the former. The cult of Harihara had greater prominence than Buddhism. The Chinese pilgrim Yi Jing reported that a "wicked king" had destroyed Buddhism. The cult of the lingam, or stone phallus that patronized and guaranteed fertility to the community, characterized the religion of Chenla. Dedicated by Rajendravarman in 948 C.E., Baksei Chamkrong is a temple-pyramid that housed a statue of Shiva. The Khmer king Jayavarman II, whose assumption of power around 800 C.E. marks the beginning of the Angkorian period, established his capital at Hariharalaya (today known as Roluos), at the northern end of the great lake, Tonle Sap. Harihara, the name of a deity that combines the essence of Vishnu (Hari) with that of Shiva (Hara), had been favored by the Khmer kings. Jayavarman II’s adoption of the epithet "devaraja" (god-king) signified the monarch's special connection with Shiva. Changes in religious architecture marked the beginning of the Angkorian period. During the reign of Jayavarman II, the single-chambered sanctuaries typical of Chenla gave way to temples constructed as a series of raised platforms bearing multiple towers. Increasingly impressive temple pyramids came to represent Mount Meru, the home of the Hindu gods, with the moats surrounding the temples representing the mythological oceans. Typically, a lingam served as the central religious image of the Angkorian temple-mountain. The temple-mountain sat at the center of the city, and the lingam in the main sanctuary constituted the focus of the temple. The name of the king, combined with the suffix "-esvara" which designated Shiva, made the name of the central lingam. Through the worship of the lingam, the people identified the king with Shiva, and Shaivism became the state religion. Thus, an inscription dated 881 C.E. indicates that king Indravarman I erected a lingam named "Indresvara." Another inscription tells us that Indravarman erected eight lingams in his courts named for the "eight elements of Shiva." Similarly, Rajendravarman, whose reign began in 944 C.E., constructed the temple of Pre Rup, the central tower of which housed the royal lingam called "Rajendrabhadresvara." Suryavarman proclaimed his identity with Vishnu, just as his predecessors had claimed consubstantiality with Shiva. In the last quarter of the twelfth century, King Jayavarman VII departed radically from the tradition of his predecessors when he adopted Mahayana Buddhism as his personal faith. Jayavarman also made Buddhism the state religion of his kingdom when he constructed the Buddhist temple known as the Bayon at the heart of his new capital city of Angkor Thom. 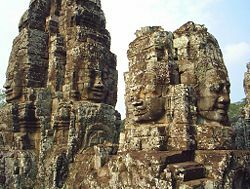 In the famous face towers of the Bayon, the king represented himself as the bodhisattva Avalokiteshvara moved by compassion for his subjects. Jayavarman perpetuated the royal personality cult of Angkor, while identifying the divine component of the cult with the bodhisattva rather than with Shiva. The Hindu restoration began around 1243 C.E., with the death of Jayavarman VII’s successor Indravarman II. The next king Jayavarman VIII, a Shaivite iconoclast, specialized in destroying Buddhist images and reestablishing the Hindu shrines that his illustrious predecessor had converted to Buddhism. During the restoration, the Bayon became a temple to Shiva, and its image of the Buddha cast to the bottom of a well. Everywhere, lingams replaced statues of the Buddha. When Chinese traveler Zhou Daguan came to Angkor in 1296 C.E., he found three separate religious groups. 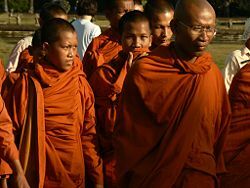 Theravada Buddhism appeared the dominant religion. Zhou observed that monks had shaven heads and wore yellow robes. The Buddhist temples impressed Zhou with their simplicity. He noted that the images of Buddha had been made of gilded plaster. The other two groups identified by Zhou appear to have been those of the Brahmans and of the Shaivites (lingam worshipers). About the Brahmans Zhou had little to say, except that they often served as high officials. Of the Shaivites, whom he called "Taoists," Zhou wrote, "the only image which they revere is a block of stone analogous to the stone found in shrines of the god of the soil in China." In the course of the thirteenth century, Theravada Buddhism coming from Siam (Thailand) made its appearance at Angkor, gradually becoming the dominant religion of Cambodia displacing both Mahayana Buddhism and Shaivism. The practice of Theravada Buddhism at Angkor continues until this day. The area of Angkor has many significant archaeological sites, including the following: Angkor Thom, Angkor Wat, Baksei Chamkrong, Banteay Kdei, Banteay Samré, Banteay Srei, Baphuon, the Bayon, Chau Say Tevoda, East Baray, East Mebon, Kbal Spean, the Khleangs, Krol Ko, Lolei, Neak Pean, Phimeanakas, Phnom Bakheng, Phnom Krom, Prasat Ak Yum, Prasat Kravan, Preah Khan, Preah Ko, Preah Palilay, Preah Pithu, Pre Rup, Spean Thma, Srah Srang, Ta Nei, Ta Prohm, Ta Som, Ta Keo, Terrace of the Elephants, Terrace of the Leper King, Thommanon, West Baray, West Mebon. Angkor Khmer term meaning "city" from the Sanskrit nagara. Banteay Khmer term meaning "citadel" or "fortress," which is also applied to walled temples. Esvara or Isvara a suffix referring to the god Siva. Gopura Sanskrit term meaning "entrance pavilion" or "gateway." Jaya a prefix meaning "victory." Phnom a Khmer term meaning "hill." Prasat a Khmer term meaning "tower," from the Sanskrit prasada. ↑ Angkor. UNESCO World Heritage Site. Retrieved February 20, 2009. ↑ Map reveals ancient urban sprawl BBC News, 14 August 2007. ↑ Charles Higham. 2001. The Civilization of Angkor. (University of California Press. ISBN 9780520234420), 53 ff. ; David Chandler. 1993. A History of Cambodia. (Boulder: Westview Press. ISBN 9781863734653), 34 ff. ↑ George Coedès, (1943)1947. Pour mieux comprendre Angkor. (reprint Paris: Musée Guimet), 10. ↑ Higham, 60; Chandler, 38f. ↑ "Map reveals ancient urban sprawl" BBC News, 14 August 2007. ↑ Higham, 112 ff. ; Chandler, 49. ↑ Higham, 134 ff. ; Chandler, 71 ff. ↑ "Climate Change Killed Ancient City" The Australian, 2007, 03 14. ↑ "Tourist invasion threatens to ruin glories of Angkor" The Observer. ↑ George Coedès, (1968) 1996. The Indianized States of Southeast Asia, translated by Susan Brown Cowing. (Honolulu: University of Hawaii Press. ISBN 082480368X) 73f. Audric, John 1972. Angkor and the Khmer Empire. London: R. Hale. ISBN 0709129459. Chandler, David 1993. A History of Cambodia. Boulder: Westview Press. ISBN 9781863734653. Coedès, George (1968) 1996. The Indianized States of Southeast Asia, translated by Susan Brown Cowing. Honolulu: University of Hawaii Press. ISBN 082480368X. Coedès, George (1943) 1947. Pour mieux comprendre Angkor. reprint Paris: Musée Guimet. OCLC 3602705. Freeman, Michael and Claude Jacques (1999). Ancient Angkor. Trumbull, CT: Weatherhill. ISBN 0834804263. Higham, Charles 2001. The Civilization of Angkor. Berkeley: University of California Press. ISBN 9780520234420. Zhou Daguan, David Chandler, (Foreword), Peter Harris (Translator), A Record of Cambodia: The Land and Its People. Chiang Mai, Thailand: Silkworm Books, 2007. ISBN 9749511247. UNESCO: International Programme for the Preservation of Angkor. UNESCO. Retrieved May 12, 2008. Tourist invasion threatens to ruin glories of Angkor. The Observer, 2007-02-25. Retrieved May 12, 2008. Map reveals ancient urban sprawl. BBC News, 2007-8-14. Retrieved May 12, 2008. Angkor. UNESCO World Heritage Site. Google Maps. Map centered on Angkor Wat, with the Tonle Sap at the bottom. Illustrated online guide to Angkor with plans and maps. Kampuchea country of legend Khmer temples, maps and photos. This page was last modified on 21 March 2016, at 15:15.